I had my last long run before Rock ‘n Roll on Sunday. I was aiming for 12 miles and felt like a well-oiled machine through most of it. My pace was hovering between 9:50 and 10:30/mile which is a lot more fun than the 12-minute miles I’ve been running lately. Things have been going well at chrio and I was told to start introducing some speedwork back into my training. I’ve been doing a few shorter sprint sessions and have picked up the pace on my 4-7km runs, however I’ve been cautious with the longer runs. I made it to 11.3 miles before I felt that tiny little twinge on the outside of my knee so I stopped while I was ahead. I knew I was pushing it a little bit with the pace but I wanted to test the waters. Despite this, I’m still feeling good about Rock ‘n Roll. I have no time goals – I just want to finish without any pain. I’m going to stick to an 11:30 pace and am going to run on my own so I don’t get tempted to go faster to keep up with my friends. 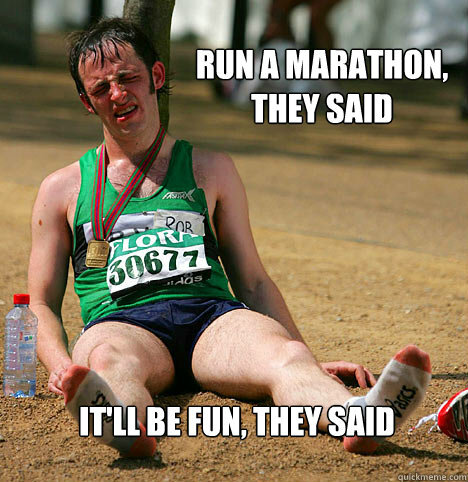 This is my last half marathon and potentially my last race of the year, so I want to finish it on a happy note. After spending some time on the foam roller and showering so I could feel like a human again, Jordan and I made the trek out to White Rock to have a Thanksgiving feast with my parents. My mom always cooks enough for an army even though it’s just the four of us. 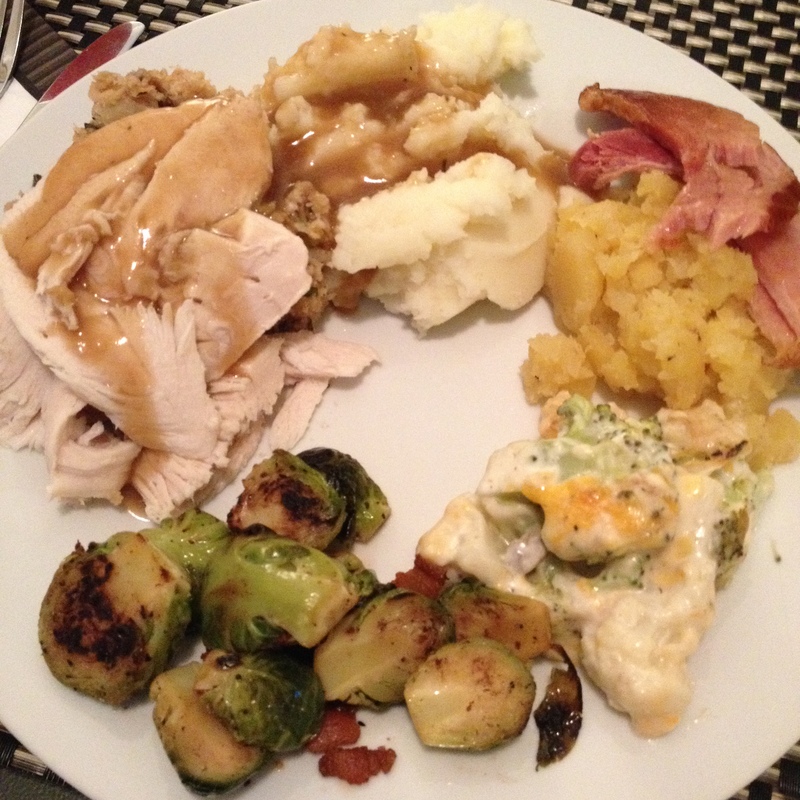 We had turkey, ham, mashed potatoes, stuffing, corn, brussel sprouts with bacon, mashed turnips, veggie casserole, cranberry & quince chutney, buns, and pumpkin cheesecake with fresh whipped cream. This is the “before” shot…after eating the brussel sprouts, casserole, and turnips, the rest gets mixed up into a pile of delicious mush. 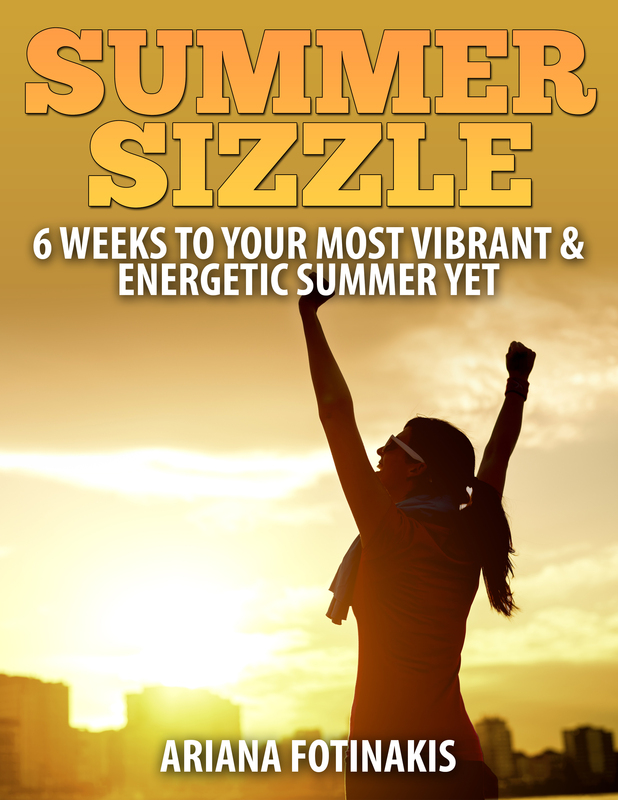 It was so inspiring being surrounded by people of all different fitness levels. There were the seasoned runners that were probably finished by the time we hit the second kilometer. There were women running with strollers, children running alongside their parents, and many people who you could tell were just beginning their running journey. It got me wondering about how these new runners felt being surrounded by seasoned pros. Did they consider themselves runners? Or did they just view this as an opportunity to burn off some of the turkey and pumpkin pie? What makes a person a runner anyway? 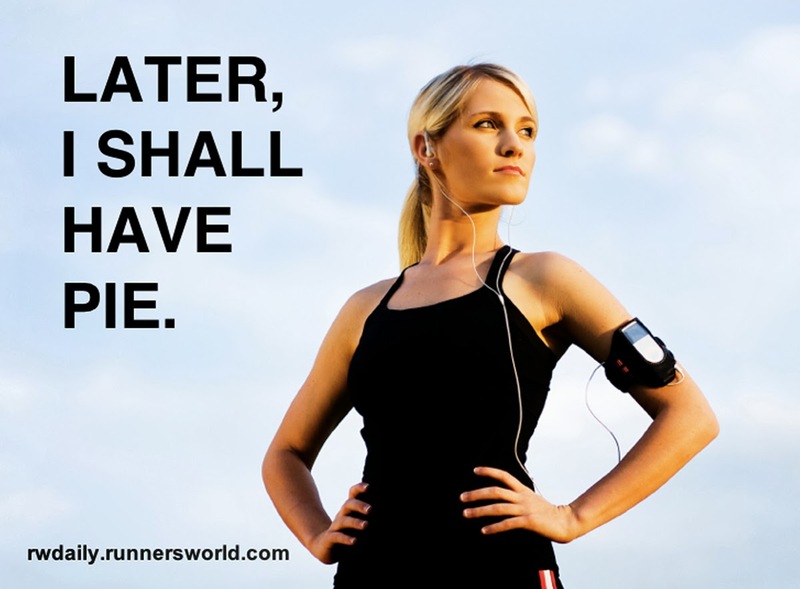 I know when I first started running I didn’t consider myself to be a runner. Sure, I ran for fun and I had a few 5 and 10ks under my belt. But for the longest time I didn’t consider myself a runner. If you’re experiencing a running identity-crisis, go through the list below and see if any of these things apply to you. 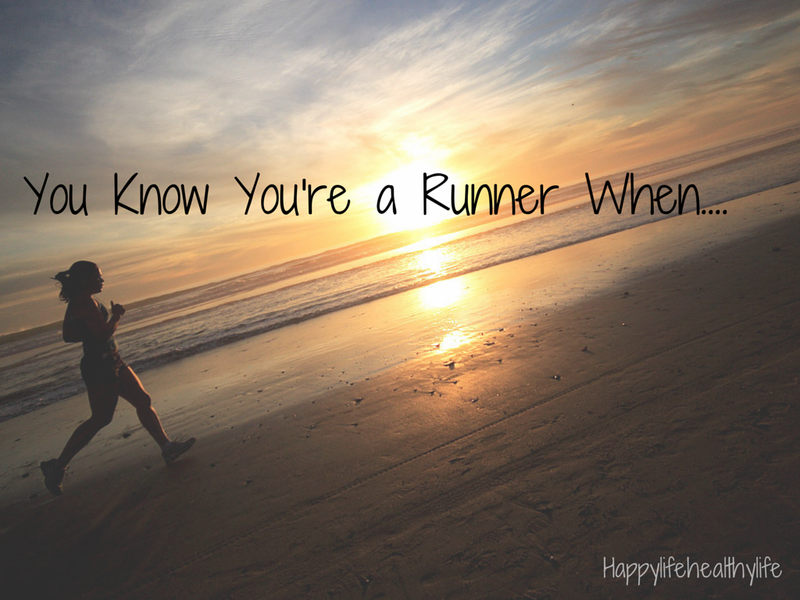 If so, you can proudly call yourself a runner! You have more athletic wear than regular clothes and you find yourself with an excessive amount of laundry to do each week. You judge a new song on the radio by how well it would fit in your running playlist. You’re willing to pay upwards of $50 to run a route you regularly run on your own, but with 1000’s of other people and a bib you can safety pin to your shirt. If there’s a medal that’s all the more incentive to pay. You have no shame in going out for a post-run brunch in sweaty clothes, because damnit, you earned those carbs. Wearing a garbage bag is totally acceptable before a rainy race. You know “PR” doesn’t refer to public relations, a “fartlek” isn’t some weird bodily function, and a “Sunday LSD” isn’t an acid trip. You’re totally okay with spending $170 on a pair of runners or $60 on a pair of compression socks, but spending more than $40 on a pair of jeans is just crazy talk. 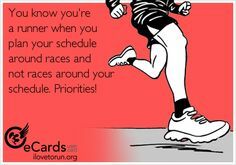 Your Sundays are planned around your long runs and your friends and family know you aren’t available until at least 1pm. You’ll run an extra lap around the block for the extra distance because you CAN’T finish a run that’s only 5.7km. Race porto-potties are acceptable but anywhere else you’ll avoid them like the plague. Your runners go on sale so you buy another pair, even though the first pair is only two months old. 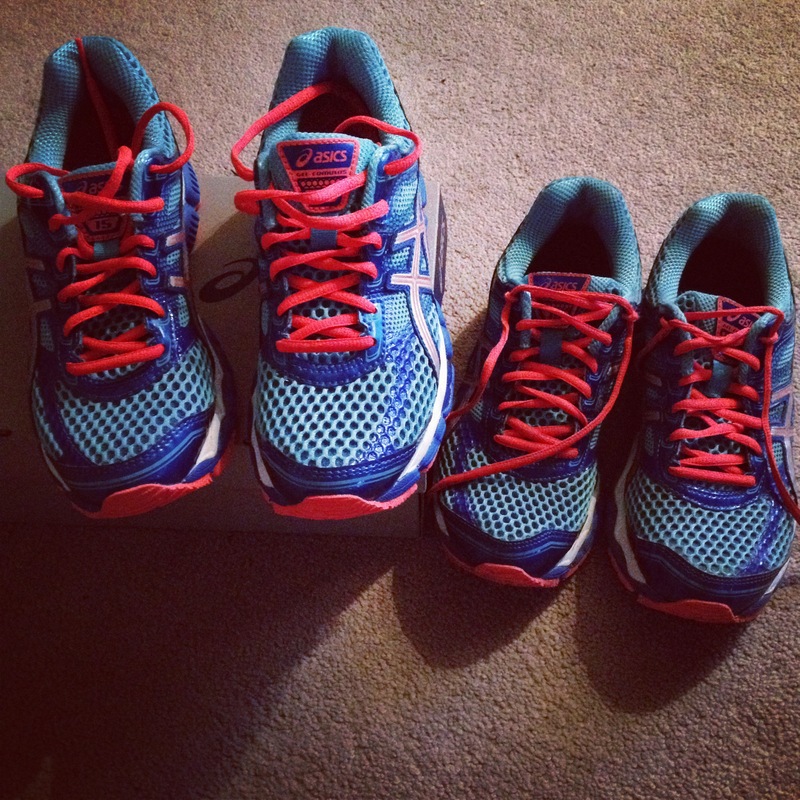 What’s better than one pair of Asics? Two pairs of Asics. When you’re running through a downpour, you get a strange sense of satisfaction by being that crazy person out running in the rain. You’ve had moments of doubt during races and have thought to yourself “I’m NEVER doing this again”, only to sign up for another race a week later. Did anyone ever really say it would be fun? What have I missed here? What other weird quirks help you identify yourself as a runner? What was your defining “I AM RUNNER. HEAR ME ROAR” moment? This entry was posted in Uncategorized and tagged cardio, exercise, fitness, goals, half marathon, humour, marathon, running, sweat pink, vancouver, weight loss. Bookmark the permalink. when… you hear a clatter in the kitchen and it’s your husband trying to clear the cupboards of all your gazillion waterbottles. When…you have to buy two of everything: two armbands, two towels, two headphone sets, an extra key, extra deo, etc. (one for your gymbag, one for home – I run from home and I run at the gym. Haha YES to the water bottles! Is it weird if I still have two of everything even though I only run from home? Haha yes! Seeing other people run always makes me want to run! Yes! $170 on shoes okay, $40 on jeans, no way! I would also say that you know you’re a runner when you find yourself having potty conversations with complete strangers on the run, like I wonder if there’s bush somewhere I can use, or start taking about the diarrhea that you had after your last long run. HAHA yup, I 100% agree! You know you’re a runner when losing a toenail is a badge of honor! Yes, I too have enjoyed the list and can easily identify!